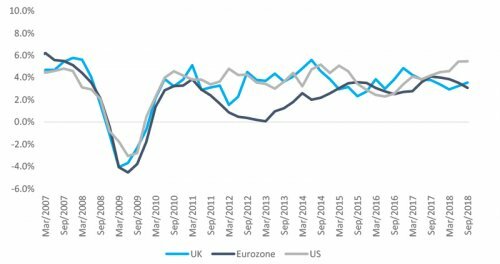 The US and UK moved fast to clean up bank balance sheets – Europe delayed and so will face the next downturn from a weaker position. A decade on, banks in some major economies have largely recovered from the global financial crisis (GFC). In others, however, legacies of bad assets continue to clog the banking system, stalling the engine of economic growth. The reasons for this divergence lie largely in the differing approaches governments took to recapitalising their banks after the crisis - and especially their willingness to confront problems comprehensively and quickly. As we move through the late stages of the economic cycle, the continuing weaknesses in some countries’ banking systems threaten to move back on to the front pages. The US acknowledged the scale of its banking crisis quickly and responded with the Troubled Asset Relief Program in October 2008. The entire banking sector was obliged to accept injections of capital from the Federal Reserve. This quickly underpinned market confidence and allowed banks to rapidly absorb big impairments in their portfolios of sub-prime mortgage securities, as well as hits to their loan books as the US economy deteriorated. The UK took a similar approach. The government injected equity into the most troubled institutions, notably RBS and Lloyds, and created a state-backed asset protection scheme. The failed mortgage lenders Northern Rock and Bradford & Bingley were split into a good bank/bad bank structure, with the bad assets passing to the state-controlled UK Asset Resolution. At the same time, the Bank of England provided unlimited liquidity to address solvency concerns. Ireland initially guaranteed the debts of all its banks, which placed huge strain on the sovereign balance sheet. Then in late 2009 the government moved to shift toxic assets into a state-backed bad bank, the National Asset Management Agency. It injected capital into the good banks while NAMA purchased the bad assets at or close to market value, allowing breathing space for the restructured banks to recover. But the recapitalisation of Ireland’s banks caused large budget deficits. There was no consistent approach to recapitalisations across Europe. Institutions such as UBS, ING and KBC were restructured on an ad hoc basis, but governments, central banks and regulators on the continent were generally slower to confront systemic weaknesses in their banking systems. As a result, many banks remained paralysed by their burdens of doubtful and non-performing loans, and lending to the real economy shrank. By 2012, Spain began to acknowledge its problems and created a bad bank, Sareb, to receive more than €50 billion of the toxic real estate assets weighing down its commercial lenders. Having shifted bad assets to a bad bank, the Spanish banking sector consolidated, and balance sheets were recapitalised, signalling the start of Spain’s return to health. The picture in Italy is very different because the problems in its banks have never been fully addressed. There have been ad hoc solutions for institutions such as Monte di Paschi and the Venetian banks, but no comprehensive recapitalisation. Germany experienced major problems in its Landesbanken - the country’s network of government-owned wholesale banks - which had invested heavily in toxic US real estate assets. As their problems emerged, several Landesbanken failed and had to be recapitalised by the government. The biggest problems in Germany’s private banking sector were at Commerzbank, which was also bailed out by the state. A decade on, the health of these countries’ banks largely reflects the differing approaches governments took to recapitalising following the GFC. US banks returned to health quickly, buoyed by the country’s strong economic performance. Today their capital positions are strong, as demonstrated by the Fed’s regular stress tests, and they have pay-out ratios of more than 100%, meaning they are returning surplus capital to shareholders. However, the German banking system has yet to recover fully, while Italy has not addressed its banks’ bad asset problem. As a result, they are unable to support economic growth: the eurozone economy is two-thirds bank-funded and SMEs account for two-thirds of the Italian economy, yet the stock of bank lending to Italian SMEs has been shrinking for 10 years. Clearly, the way the US recapitalised its banking system after the GFC allowed it to absorb losses and continue lending into the real economy, boosting corporate growth and GDP in the years following the crisis. But in Europe this was not the case, and with the knock-on effects of banks failing to support SMEs, overall GDP growth lagged the US and the UK for much of the post-GFC period (see Figure 1). Source: Bloomberg, 31 December 2018. 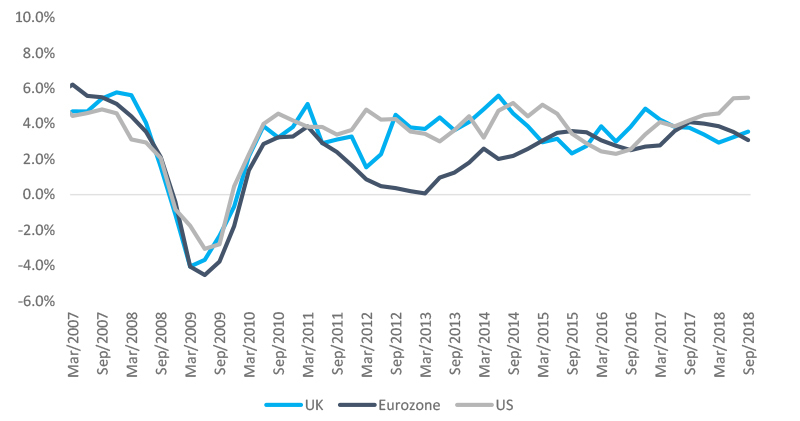 As developed economies approach a turn in the cycle, US and UK banks are much better placed: they face any downturn with the highest levels of capital, the strongest liquidity and the most robust regulatory framework that has existed for many decades. Equity valuations could be badly hit in a recession, but their balance sheets can withstand a downturn. On a traffic light system, the US and UK are green. In Europe, we give Spain an amber light, although we regard its banks as investable. But in both Italy and Germany the light is red. Italy faces the biggest challenge. If it enters recession its banking system will need recapitalising, but the government will struggle due to its large debts and budget deficit. This could shift the burden to the European Union. The major risk is that Italy’s weak banking system sparks a sovereign crisis. This risk is compounded in Italy’s case by the fact that the EU’s bank resolution framework now obliges governments to wipe out shareholders and senior bondholders as a condition of any statefunded rescue. In Italy, this would be politically dangerous because approximately a third of senior Italian bank debt is held by domestic retail investors. The potential electoral difficulties are obvious, which is why an Italian banking crisis is one of the key event risks we identify, alongside a disorderly Brexit. However, we believe the risk Italy poses is potentially more serious, and yet gets little attention.